The Northeast Ohio area has so many attractions and events to offer area families. However, as the parent of a child who struggles, you may feel your child cannot handle the sensory overload of Cedar Point or wouldn't have the attention span to visit a University Circle museum. If your family struggles finding outside activities that work for everyone, how about visiting some of the area's playgrounds? 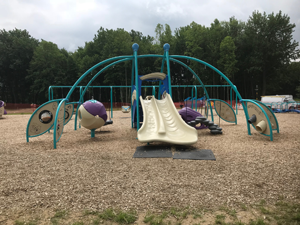 The following parks and playgrounds are recommended by other Connecting for Kids families for their activities, safety, and enjoyment. Does your family enjoy a park that is not on this list? 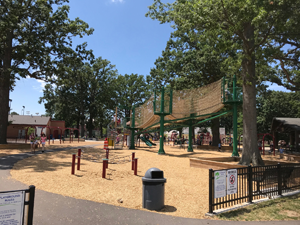 Please complete our brief survey form to share your favorite park with other Connecting for Kids families! 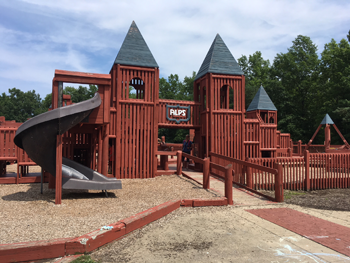 Looking for playgrounds outside our area? Check out NPR's Accessible Playgrounds for Everyone list. Adapted Equipment: The fenced play set is wheelchair accessible and offers hand activities. There is one adapted swing. A second play set (not fenced) also includes some hand and sensory activities but it is on mulch and not wheelchair accessible. Adapted Equipment: Multiple pieces of adapted equipment. Roadway/Water Nearby: There is a small lake with a fountain on the property. A walking path around the park circles the lake. Parent Comments: Good visibility (easy to watch more than one child on different equipment) and different play sets for different age groups. There is a soccer field near the playground and a covered picnic shelter close by. There is also a sand box very near the playground. Bathrooms are available across the street in the Lions Club community building. They are usually open. 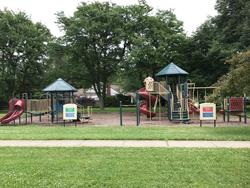 Parent Comments: Part of the Lorain County Metroparks, this small neighborhood playground is unique in the fact that is is connected via paved nature trails to the Avon Lake Public Library and its sister park, Sunset Park. Families who need a little extra activity can benefit by parking at any one of these three locations and walking the trails between them (about 3 miles round trip). Roadway/Water Nearby: There is a public beach across Lake Rd. at Veteran's Memorial Park. Adapted Equipment: The park has ramp access and a little red swing that can be used by smaller children with disabilities. Parent Comments: This park sits FAR back from the road and has a semi-fenced area for younger children that is pretty easy to guard. The play area for older children is open and visibility is not that great, but there are lots of things to play on. The park is also located across the street from a public beach. Restrooms: None, however the park is less than 1 mile from Learwood Square shopping plaza. Bathrooms are available at Giant Eagle. 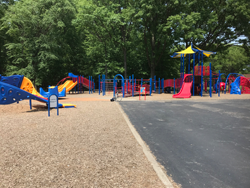 Parent Comments: This quiet playground is located behind Eastview Elementary school and includes several pieces of adapted equipment. There is a paved path to a handicap accessible merry-go-round and a collection of musical toys. The musical toys are on mulch but close enough to the pavement that a wheelchair/stroller could be pushed over. The playground has partial shade and loads of play opportunities on a giant climber. Swings are also available (not shown in photographs) but there are no infant/toddler or adapted swings. 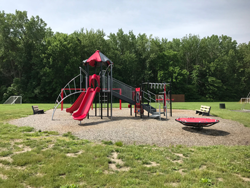 Parent Comments: Part of the Lorain County Metroparks, this small neighborhood playground is unique in the fact that is is connected via paved nature trails to the Avon Lake Public Library and its sister park, Belle Road Park. Families who need a little extra activity can benefit by parking at any one of these three locations and walking the trails between them (about 3 miles round trip). Roadway/Water Nearby: There is a creek south of the playground and dog park. Parent Comments: The playground at Weiss Field is made from artificial turf and is a great alternative after wet weather. The park is set back off the road and next to the city's dog park. Visibility varies depending on vantage point. This park also has water misters for hot days that the kids really seem to enjoy. 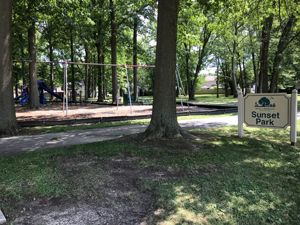 Roadway/Water Nearby: The park is located next to Dover Center Rd., but is fully fenced to prevent children from wandering from safety. Adapted Equipment: The park includes an adapted swing. Parent Comments: This partly-shaded park has LOTS of equipment, making it hard to keep track of kids, even with the gate and fence. 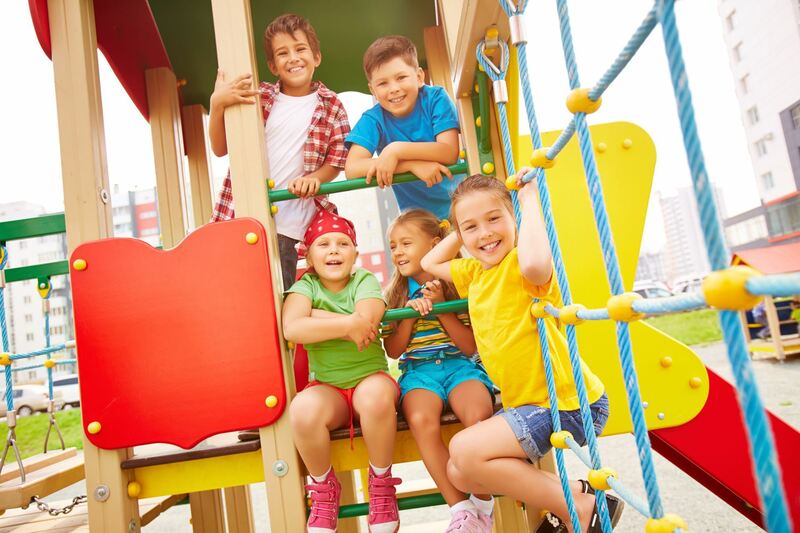 There are two distinct areas with preschool and elementary-age play sets. The preschool area also includes a sand pit that the community has loaded with dump trucks. The elementary age area is a complex network of climbers. Located within walking distance from Huntington Beach Reservation. Parent Comments: Features an ADA Fully Accessible playground. Can you add comments for this park? Click here. 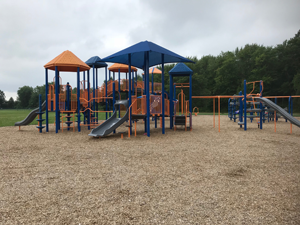 Parent Comments: This quiet playground features updated equipment, suitable for many different age levels. It is not fenced but can only be accessed by a road that has low traffic. An adapted swing is available. The park surface is mulch and there is a ramp up to access it from the main parking lot. 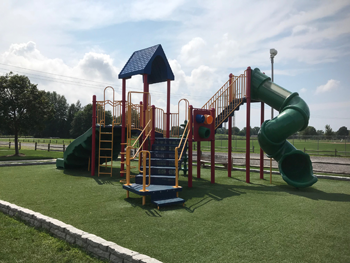 Adapted Equipment: Adapted swings, handicap accessible play set, hand-activated activities, glider and more on a wheelchair-friendly turf playground. Parent Comments: Can you add comments for this park? Click here. Hours: Open Memorial Day through Labor Day. Roadway/Water Nearby: Safe from road. No water other than fenced-in splash pad. Parent Comments: We LOVE this splash park. It is at a playground and the signs say residents only, but there is no one staffing the splash park (or checking IDs). The main reason I love this place is it is completely fenced in. Large grassy area with shade, and also a big umbrella to sit under. You can easily see children playing in splash park and nearby playground at the same time. Great visibility, very nice splash park! Includes accessible playground equipment. Roadway/Water Nearby: No water. A safe distance from the road/parking lot. There is a train that runs to the back of the park that blows it's whistle. We were there 2x and it came by each time. Can be difficult for those with hearing sensitivity. Parent Comments: Age appropriate for my boys (4 & 2). Lots of grass running space. Away from traffic. Swings are separate from the play set so less collisions. Parent Comments: This park is set back far from the street and quite shaded during the day. During the summer, evenings are busy with baseball games. Other than that, it is usually not busy at all. There are two main play areas, and a swing set. There are two baseball fields, one soccer field, and a walking path next to it. There is a pavilion, no restrooms (though occasionally I’ve seen portable bathrooms during baseball season). It is right down the street from a Starbucks, a CVS, Malley's, and two gas stations (all at Clague and Lorain) if you are in need of a restroom. Roadway/Water Nearby: Park sits between two roads with frequent traffic (which can make it difficult to keep your child safe if they wander). Parent Comments: Park sits far back from Lorain Rd., behind the baseball fields. The park has a variety of equipment, including a handicap-accessible swing and sand pit with built-in digger. Parent Comments: Park includes a residents-only splash pad (open 8 AM -10 PM during summer season). There are a lot of trees, making it good for hot days. Park also includes a nature path and nice equipment for all ages. Roadway/Water Nearby: Road and water are not issues at this park. Parent Comments: This park has a nice hill for kids to run up and down to burn energy as well as for sled riding in the winter. However, the playground does run close to the bank of the falls. There’s a wooden fence however it could be easily accessed just by climbing over. There’s also an overlook deck that offers beautiful views but again easy to climb. Roadway/Water Nearby: Park is close to two roads (which can make it difficult to keep your child safe if they wander). 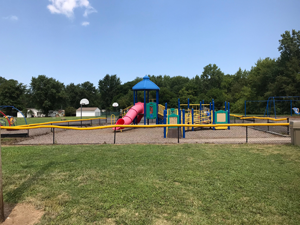 Parent Comments: Includes a newly-renovated spray fountain and small playground. Can you add comments for this park? Click here. Roadway/Water Nearby: Park has a small fence but it is not adequate to prevent access from Pleasant Valley Rd. (less than 100 yards away). Town pool is also nearby but not a concern. Parent Comments: Handicap-accessible park geared toward children ages 2-5 years old. Good visibility throughout. Restrooms: Restrooms are available at the community center. Roadway/Water Nearby: The park is very close to Hilliard and busy traffic. There is no fence between the park and the road. Adapted Equipment: Multiple pieces of adapted equipment, including a wheel chair accessible climber. 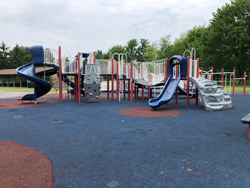 Parent Comments: This playground offers many integrated play opportunities for children with mobility challenges with a large, wheel chair accessible climber. 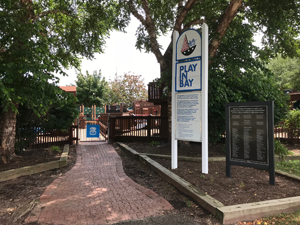 Paved paths lead to the park and the climber path, but children who want to use other sections of the playground may struggle with stepping down to the mulch surface. Age appropriate climbers are available and there is plenty of shade. Families can also enjoy a picnic in the large gazebo overlooking the playground. Parent Comments: Elmwood Park is set back in a residential area. Very easy to keep track of multiple kids. Roadway/Water Nearby: Roughly 200 yards from Linden Rd. The street has some traffic but was not terribly busy. 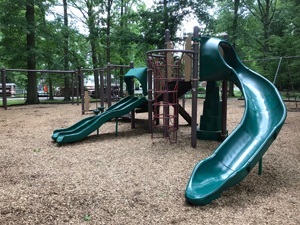 Parent Comments: This playground sits between tennis and basketball courts and features play areas for both preschool and elementary aged children. 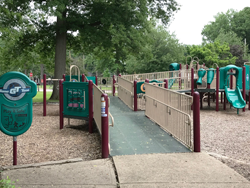 Parking is paved and a sidewalk takes you to the park (and a small picnic shelter) but it is not possible to get a stroller/wheel chair into the playground easily. The elementary age climber includes a large tree-house structure that is the highest off the ground we've ever seen. It also offers climbing walls and big slides. Plenty of shade and great vantage points from benches surrounding the playground make it easy to keep an eye on kids. 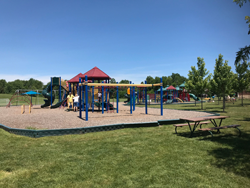 Parent Comments: It is 3/4 fenced in, a pavilion with bathrooms, walking track, basketball court, playground, baseball diamond. It's at the end of a development, not busy and is fantastic!!! Check it out!! Parent Comments: This park has a beach, but no swimming. Can you add comments for this park? Click here. Roadway/Water Nearby: Less than 50 yards form Walker Rd. 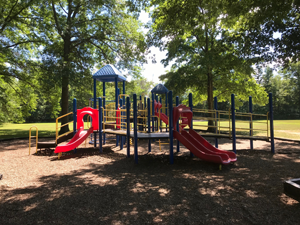 Parent Comments: This park is in a quite neighborhood and usually there are only a couple kids playing there at a time; however, it gets quite busy on Saturday and Sunday during soccer season. The park offers relatively new equipment, including a climber with multiple slides, swings, a spinner and a bouncer. There is no shade on the playground, but a picnic pavilion sits nearby. Roadway/Water Nearby: About 300 yards from SOM Center Rd. Adapted Equipment: Multiple pieces of adapted equipment and padded play surface that accommodates strollers/wheel chairs. Parent Comments: This playground includes two play areas on a padded play surface that is stroller/wheel chair accessible. The toddler/preschool area includes adapted swings and is fenced. 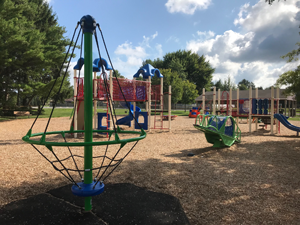 The elementary age play area offers a wheel chair accessible climber, slides, swings, and other climbing activities. 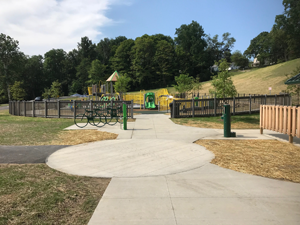 paved parking and path are available to access the playground. There is no shade on the playground, but a pavilion sits nearby. Families can also visit the safety town next to the play ground area to practice safety skills. Roadway/Water Nearby: The park sits back from Bradly Rd., but a shallow pond is easily accessible from the playground. Parent Comments: Off the beaten path, this park is usually not too crowded. Equipment suits multiple age ranges and visibility is good for families with multiple children. Frog pond is fun to visit during spring and summer. Sledding hill during the winter. Roadway/Water Nearby: Road is a good distance from the playground equipment. There is also a duck pond on the other side of the pool. Parent Comments: Playground equipment at this park is spread out, making it hard to keep an eye on multiple children - but there is a lot to do and equipment is set up by age. This park also includes a duck pond that is a lot of fun for families. Roadway/Water Nearby: Road and water are not issues. Parent Comments: Not fenced and no shade but never anyone else there in the mornings. Roadway/Water Nearby: The park includes a supervised fishing pond and splash pad. Parent Comments: According to the website, a day pass for the playground is $2 (a three-month membership can be purchased for $40). The fee may be waived for children with orthopedic and other concerns. Playground includes a splash pad, wheelchair accessible equipment, and access to a quiet room + sensory room. It's an absolutely amazing park! Parent Comments: Free and open to the public. Be warned that although it is fenced in, this playground is very large. Unless you have an older child that you can trust to be on their own without supervision, I would recommend that you have a one adult to one child ratio when you visit.